I have a dream of owning my very own beer garden. I was born and raised in Atlanta. I experienced the joy of Stone Mountain fireworks both before and after the monstrous Confederate engraving completely changed meanings for me. I know where I was when “Sid slid.” I have more than occasionally, drunk Coke at breakfast. So, when I was living in Japan and I learned of a beer garden opening IN Atlanta, I was happy and intrigued. I checked out their website and studied over pictures and Google maps. I would definitely have to visit as soon as I returned. When that time actually came, “as soon as I returned” turned into about a month of stagnation. I don’t know why, but I was kind of intimidated by this establishment. I’m not totally sure why, but I think that it marks the beginning of my journey into the beer garden life and it is a trepidatious first step . But, I had to go. After all, it’s right over there. 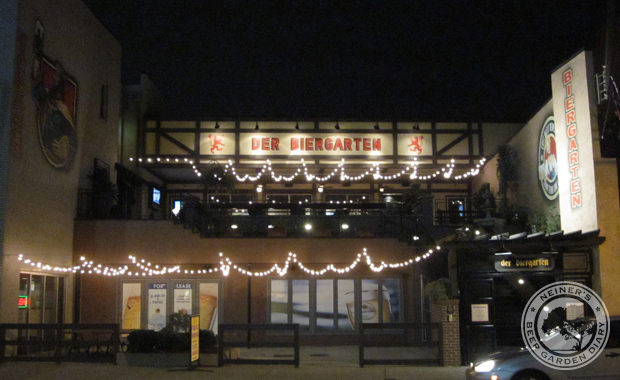 Der Biergarten opens at 5:00 for the post-work day. On a Wednesday in late April, I called up (read: texted) my friends Annie and Matt to be my drankin buds for the evening. The transportation decision was between taking MARTA to Phillips Arena Station and walking about 10 minutes, or utilizing Der Biergarten’s 3 hour validated parking at the Hilton Garden Hotel across the street. I would like to say that I mulled over MARTA for a few minutes in my heart, but my brain knew instantly that we would be driving. Annie and I parked easily enough on the 7th floor. The area is right next to all of Atlanta’s big event arenas: The World Congress Center, Phillips Arena, Centennial Olympic Park, The Georgia Dome. As we walked down Marietta street looking for our destination, we passed a few decent looking restaurants and bars. And there it was, on the left. We look up and see the name in big letters DER BIERGARTEN. The drinking and eating takes place up a set of steps that weaves back and forth one time across the entire front of the place. On either of the walls in front and behind you, there is a painted figure of a German beer lady or a King. Right in front of you, as you reach the top, is a nice patio area with about ten green 8-person picnic tables with aluminum frames. Half of the area has a rain awning. There are a few potted plants scattered about the perimeter of the patio area. You can see the indoor seating area that is just as big but contains a bar in the back left. On the far left wall there are 3 TVs, 2 inside, 1 out. To the left, there is door that leads into a mid-sized indoor restaurant area. It looked pretty nice, but completely empty. The people that came and went were mixed. Mostly middle-aged or younger. Men and women almost evenly split. Everyone seemed pretty relaxed and happy. We sat ourselves and waited for Matt. From the patio we can see a hint of the park and heaping helping of the Hilton’s parking garage. Since you are situated a level up from the street and recessed back a good 20 feet from the sidewalk, you can ignore the view if you want. We were met by our pleasant waiter with a menu. In it was almost exclusively German food, and almost exclusivelier German beer. There were a few recognizable names there, but I couldn’t really place where I even knew the names from except Optimator. The menu lists their, about 12, German beers from light to heavy. This was nice as we decided to work our way down the menu. We ordered light at first. Beers come in liter and half liter. This is a profound difference! Both of us just said the name of what we wanted and the liter size is what was delivered. If you want half liter, say half liter. We check our watches (read: phones) and saw that we had missed our 3 hour validated parking window by an hour. Since we already missed our free parking ($10 unvalidated), we decided to venture to the top of the parking deck for a view of the city. We couldn’t find any unlocked doors to the roof. What followed was a series of, what can only be called, trespassings. Fences were climbed, locked doors were opened and a soon to be opened VIP bar (with helipad) was toured. It will be much nicer than any bar we would be able to get into so we were thrilled! We got our rooftop view and a nice adrenaline rush that only spies and unruly high schoolers seem to be privy to: sneaking into a restricted area. Ultimately, no matter where you choose to spend your evening, your company determines your base level of enjoyment. I liked Der Biergarten, and I liked trespassing on the unopened rooftop bar, but in the end, I loved the strange evening out with friends that featured those 2 things. How many people can be there in Max? Do you have their beer photos? Fun times, it’s too bad we didn’t get to try out more places before you left. Have fun on your tour and don’t forget to bug me!